India is accelerating development of renewable energy projects to provide cheap, reliable and clean energy to its 1.3 billion people. 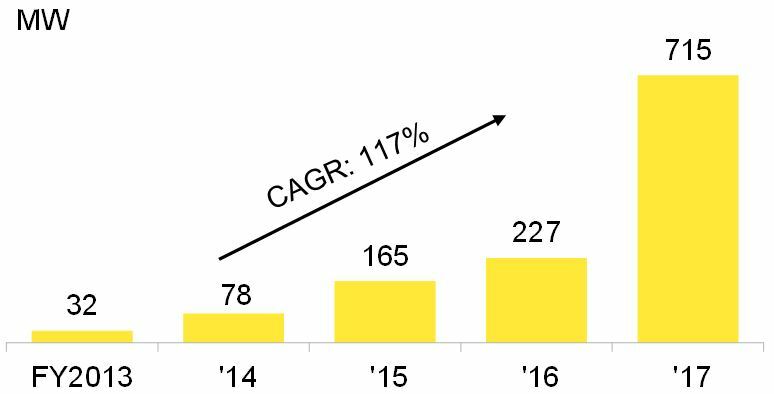 Rooftop solar continues to be the fastest growing sub-sector, and needs to grow faster still to reach the ambitious 40GW target, which presents a $23 billion investment opportunity. Below are the key findings from BNEF’s latest report on renewables in India. You can download the full report here. Source: Bloomberg New Energy Finance, industry surveys, Ministry of New and Renewable Energy. Note: India’s financial year is from April to March. Installation of renewable energy projects will be higher than fossil fuel technologies for the first time in 2017 and in the years thereafter. The country added 12GW of renewable energy plants in FY2017 (April 2016 to March 2017) – a 66% year-on-year growth over FY2016. However, India achieved only 3% of its target capacity addition of 40GW by FY2022. 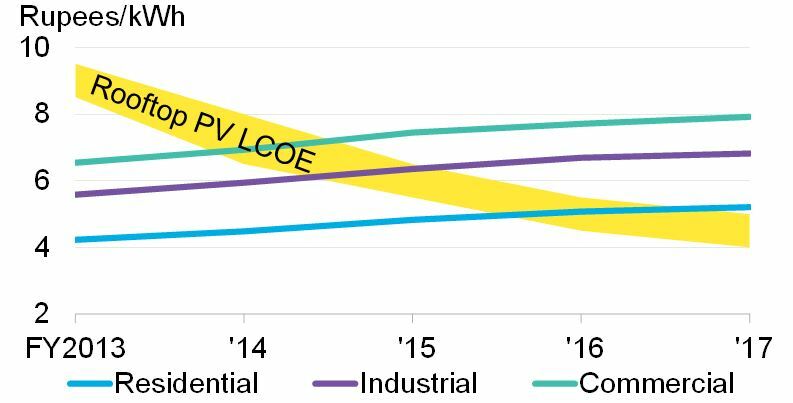 Residential sector PV growth will pick up post-2021. High upfront capital expenditure compared to commercial and industrial (C&I) consumers, lack of financing options, and cheaper grid electricity for residential consumers with low consumption currently make rooftop PV less attractive for residential consumers than their C&I counterparts. PV has big potential to power irrigation and reduce the use of back-up diesel generators. 60GW of small-scale PV can be deployed across various sectors consuming diesel. India’s ambitious targets have received a shot in the arm from falling capital costs. India would need $83 billion between FY2018-FY2022 to meet its 175GW target. Utility-scale renewable energy aspirations of 135GW will require $19 billion less than our previous estimates. The average cost of debt for renewable energy projects in India has come down. However at 9-11%, debt is still among the most expensive in Asian countries. Costs of electricity from rooftop PV have halved in the last five years. Fierce competition in the market and drop in equipment costs have led to cheaper rooftop PV power. In contrast, average retail electricity prices have increased by 22% in the same period. Source: Bloomberg New Energy Finance, industry surveys. Note: India’s financial year is from April to March. Government policies and auctions are driving growth but have also increased risks. Auctions have become the preferred mode of adding power generation capacity in India. Plans to hold more auctions across states and technologies provide visibility on future projects. However, concerns are increasing that intense competition is forcing bidders to expose themselves to higher project risks. Growth of rooftop solar in India looks inevitable with or without the support of distribution utilities. This presents an opportunity for power distribution companies to diversify and start their own rooftop solar business rather than lose customers to other competitors. Power distribution companies can also partner with rooftop PV companies to provide operations and maintenance (O&M) services, billing, lead generation, branding and sales support. Download a copy of the full report here. This report is a follow-up to Financing India’s Renewable Energy Transition, published in November 2016. Bloomberg New Energy Finance was supported by The David and Lucile Packard Foundation. The content and conclusions are those of Bloomberg New Energy Finance alone, based on our own independent analysis.